We slowed down a bit this weekend for a visit from adored family and for an autumnal art project. 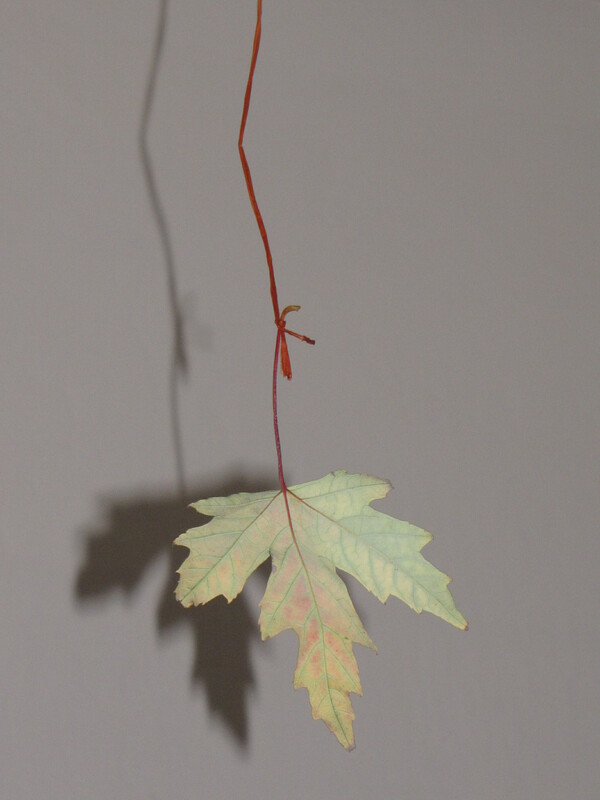 It took hours to walk at toddler pace to the grocery store collecting leaves, but when we suspended two dozen grape, maple, and sycamore leaves from the living room ceiling, the result was magical. The trip also harnessed the energy of the wee ones, who seemed more mellow after their sensory walk. Thank you, neighbors, for the chicken rest stop. This entry was posted in Feels like home and tagged autumn, backyard chickens, children's art projects, fall. Bookmark the permalink. ← And now we have ants. The trees have turned here too. So pretty. Fall is my fave time of year. Awwwwwww with the boys. Too cute. The curls…oh how i miss the curls. Looks like both of your boys are keeping them though. @unicorn We have such muted, prolonged Fall out here that I love grabbing the few good leaves we can find. It just doesn’t get cold enough for good leaves or snow. I’ll take that compromise. Those curls! I just want to attack those boys, sit on them and pet them until they’re 16. Just lovely. I am so missing fall and miss it for my children who know nothing about the northeastern autumns I grew up with. Southern CA has it’s perks…the weather is OK :) But, there is nothing like the smell of freshly fallen leaves. I just wrote about this perfect season myself. You’re blog makes me happy. What a lovely thing to say, Emily. We’re just north of you but we get something closer to Fall than SoCal does. I lived there for a few years and remember that it’s summer for 9 months and rainy for 4. No good leaves. Here we get a few. But it’s nothing like my Autumns in Boston. Dang that place makes you want a camera with you for six straight weeks. Then a bottle of whisky for six months. Exactly! I know it well. I went to school in Boston. Beautiful Place…and VERY cold. Not much different than my home town in Upstate New York. But, I always say you never get used to being that cold. Some of that chilled-to-the-bone is why people on the East Coast can be so very cold to outsiders. I think they build a thick wall hoping to keep the cold out but in the process keep humanity out. In general. Generalizing and stereotyping. And assuming. Because it’s Fall and they’re still friendly. Well, friendly-ish. @tara I remember how mud season made me cry because ENOUGH WITH THE GODDAMNED COLD ALREADY! Actually, September made me cry, too, because in the street lights rain looks like snow and snow means…well, I already wrote that. Good luck. And remember to move your car the *second* the ice storm is done. You’re welcome in advance. How can Butter be that big already? He should still be a baby, not a little man! 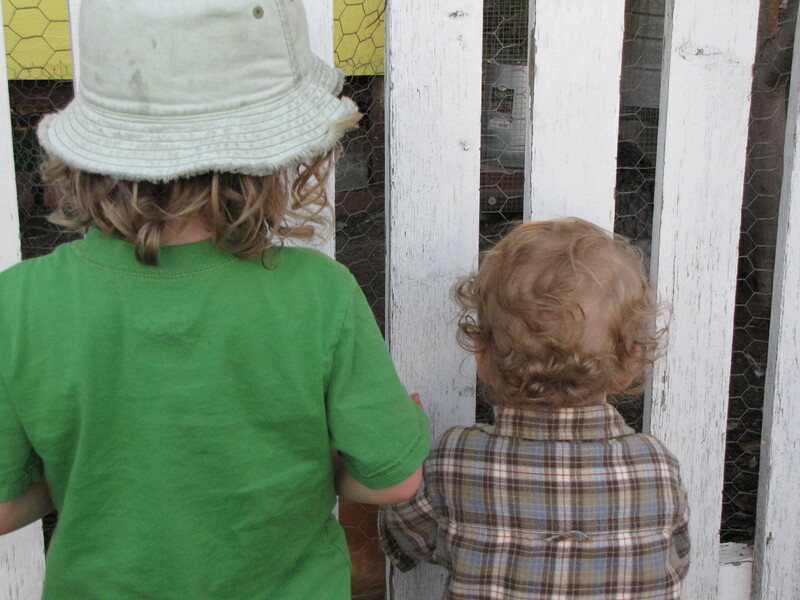 Behind a fence is the best place for chickens when there’s a toddler around. @ck Look who’s talking. TWO should be toddling, not listing her allergies. @kristin LOL. We have two friends with chickens who “let” the littlest guy in their yard every once in a while and I have no doubt from watching them interact with him that the neighbors’ chickens appreciate the distance.